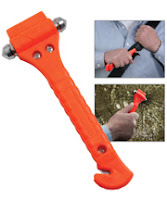 Get a Free Escape Hammer from Freebizmag. All you have to do is provide the information that they are asking for and you can be entered into the drawing of the Escape Hammer. There will be 200 winners chosen from this drawing, so it will not be just one person that wins it all. When you click on the link it might say that the session is expired, but after you click "OK" it will reload and take you to the right page.